Practical inspiration for 3D enthusiasts and professionals. Packed with amazing images, detailed tutorials and Q&A’s with inspiring artists, 3D Artist magazine is an essential read for all 3D and VFX artists. 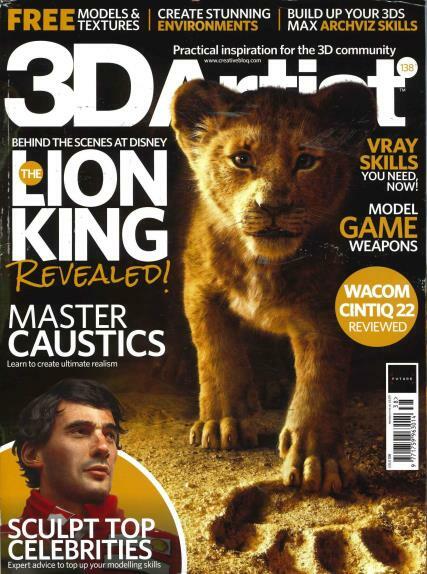 Buy a single copy or subscription to 3D Artist magazine. From expert tutorials covering the whole pipeline to incredible industry-led features on the likes of Pixar and Blur Studio, 3D Artist is the ultimate monthly magazine for 3D students, enthusiasts and professionals. PLUS: as a subscriber to 3D Artist, you have access to hundreds of creative resources via FileSilo - all for free! You’ll find 3D assets, plugins, Photoshop assets, video tutorials and more. 3D Artist’s FileSilo is a rapidly growing library that’s updated continually with cool resources. Secure online access makes it easy to keep your downloads organised, plus you can browse and access the content from anywhere, whether you’re a print or digital subscriber. Packed with amazing images, detailed tutorials and Q&A’s with inspiring artists, 3DArtist magazine is an essential read for all 3D and VFX artists.